Radiologic technology is currently a promising field for young Kentucky professionals. 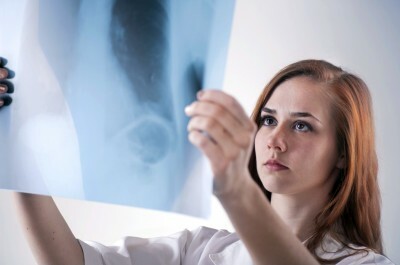 There are a wealth of good educational programs offering a range of degrees in radiologic science, and salaries in the field are higher than the national average. This profession is expected to grow faster than the national job growth rate, affording good job opportunities to qualified individuals. The average salary for radiologic science professionals in Kentucky is below the average salary in this field nationwide. Kentucky radiologic technologists currently earn an average annual salary of $51,730, compared to $60,320 for radiologic technologists across the US. This means that most radiologic technologists can expect to earn more than the median salary in Kentucky of $42,410. In addition, Kentucky is a relatively inexpensive place to live. More information on Radiologic Technologist salaries in Kentucky. Practicing Kentucky professionals in radiologic science must be certified by the state through the state exam or approval by the state health cabinet. They must also be certified by passing the American Registry of Radiologic Technologists (ARRT) exam. Limited license X-ray technicians may practice in Kentucky, but may not be employed at any medical center than uses contrast media. Radiologic technologists, nuclear medicine technicians, and radiation therapists must all fulfill at least 24 hours of continuing education every two years in order to remain licensed. Limited license X-ray technicians must fulfill 12 hours, and radiologic assistants must fulfill 50 hours. Northern Kentucky University: Northern Kentucky is a large public university that is in the larger metropolitan area of Cincinnati, OH. The school offers a Bachelor of Science in Radiologic Technology degree accredited by the Joint Review Committee on Education in Radiologic Technology (JRCERT). This program provides extensive clinic hours in various Cincinnati area hospitals, such as Cincinnati Children’s Hospital Medical Center, Dearborn County Hospital, and Mercy Hospital Anderson. Morehead State University: This public university in northeastern Kentucky offers a range of degrees and courses in diagnostic medical imaging. Students at Morehead can pursue an Associate of Applied Science (AAS) degree in Radiologic Science. Morehead State’s Radiologic Science program is accredited by the Joint Review Committee on Education in Radiologic Technology and has a selective admission process, limiting the number of students who can be admitted each year. Students wishing to obtain a Bachelor of Science degree can choose from programs in Diagnostic Medical Sonography, Computed Tomography and Magnetic Resonance, and Leadership in Medical Imaging (offered online). Jefferson Community & Technical College: Jefferson is a open admission community college that offers a full-time 21-month Associate of Science in Radiography degree program that will prepare them for the ARRT exam. Clinical education takes place in numerous hospitals located in the dynamic Louisville metropolitan area. Southcentral Kentucky Community & Technical College: This school, formerly Bowling Green Technical College, is another option for an affordable AAS degree in radiography from one of Kentucky’s 16 open admission community colleges. This selective admission program requires four consecutive semesters and one summer commitment with an average weekly involvement of 30-40 hours. Bowling Green is also one of the larger cities in Kentucky, and a great location to seek employment. There are alternatives to the northwest in Chicago and other parts of Illinois, to the north in Indianapolis, Cincinnati and Columbus, to the south in Nashville, Knoxville, and Charlotte, and to the east in Greensboro and Roanoke. There are a number of large hospitals and medical centers in Kentucky, and these facilities are the largest single employers of radiologic science professionals in the state. Kentucky has one hospital that has been nationally ranked by the US News & World report, and several others with high-performing specialties. The leading professional organization for radiologic technologists in Kentucky is the Kentucky Society of Radiologic Technologists (KSRT). This is the state chapter of the American Society of Radiologic Technologists. This society aims to provide professional growth, education, and employment resources to professionals in Kentucky, as well as advocate for health policy that promotes radiologic technology.